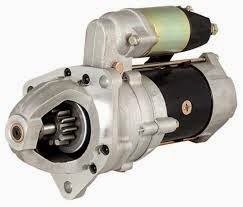 The Starter motor in Automobiles is a DC motor which draws a high current. When the key is turned in the ignition, a solenoid operates a switch which connects the battery to the starter motor. This starter solenoid switch is designed to carry the heavy current which flows from the battery to the starter. The starter motor engages with the a large gear ring around the rim of the engine flywheel. The motor is designed to generate heavy torque which can turn the engine. The engine of the car thus rotates. As it rotates, it draws air and fuel into it cylinders and the engine begins to rotate on its own. As soon as the engine picks up speed, the starter motor disengages and the ignition is switched off. The starter motor is usually a permanent magnet DC motor or a DC series-parallel wound motor.